Book Genres – This website is devoted to genres of books. 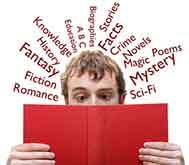 It’s the only website with an easy to use Book Genre Finder and definitions for every book genre. Here you’ll find detailed descriptions and examples of all fiction genres, nonfiction genres, and book genres for kids. * What is the genre of a book? * What is the definition of a sub-genre? * How many types of book genres are there? * What are the different genres of books? * What are the most popular book genres? * What is your book genre (if you’re an author)? * What are the best book genre definitions? * Where can you see a complete list of book genres? Are You An Author Researching Book Genres? Authors of all genres (fiction, nonfiction, and children’s books) have used our websites for authors to get top literary agents, publishers, and book deals. Authors who’ve used our resources have been offered representation with well-known literary agents including: Jim Hart, Sarah Jane Freymann, Matthew Carnicelli, Jill Marr, Don Fehr, Felicia Eth, Mark Gottlieb, Stephany Evans, Bill Contardi, Jennifer Di Chiara, Harvey Klinger, and more.